Rare map of Washington DC before Virginia retrocession. This is a rare and beautiful 1835 map of the District of Columbia by the important American mapmaker T. G. Bradford. It depicts the District of Columbia prior to the retrocession of Virginia, which included the lands donated by the states of Maryland and Virginia. It covers Washington City, and the Washington County along with the settlements of Georgetown on the eastern side of the Potomac River and the settlement of Alexandria and the County of Alexandria on the western side of the Potomac. The Capitol, President's House, City Hall and other important places of interest are identified with a key in the lower left quadrant. in 1791, following the Residents Act, the District of Columbia was formed from the lands donated by the states of Maryland and Virginia. In the 1830s' after Alexandria went into economic decline due to negligence by Congress, residents petitioned Virginia to take back the donated land through retrocession. 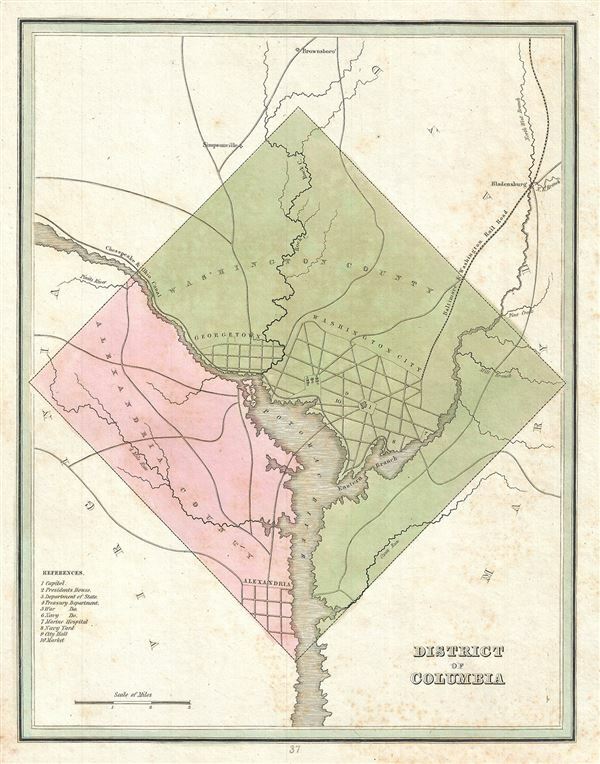 In 1847, the retrocession legislation was formally accepted and the county of Alexandria was returned to Virginia, leaving Washington County part of the District of Columbia and forming the current boundary of the county's capital, Washington DC. This map was published as plate no. 37 in Thomas G. Bradford's 1835 Comprehensive Atlas Geographical, Historical and Commercial. Bradford's atlas, published in 1835 was an important work on many levels. First, it was one of the first American atlases to follow an encyclopedic format, offering readers extensive geographical and statistical tables to supplement the maps themselves. Second, it was published in Boston and influenced the city's rise as a publishing center later in the 19th century (at the time most publishing in the United States was restricted to New York and Philadelphia). Third, this atlas was the first to contain a separate and specific map showing the Republic of Texas. Fourth and finally, Bradford's atlas in some instances broke the Euro-centric mold regarding atlas production. Among other things, Bradford focused his atlas on the Americas and abandoned the classical decoration common in European atlases in favor of a more informational and inherently American approach. Very good. Original platemark visible. Minor spotting overall. Blank on verso.